Catfishing holidays along our prolific private stretches of the Lower River Ebro in Catalonia. 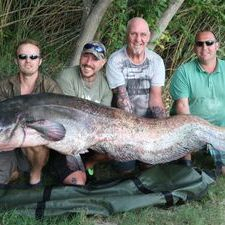 The Wels Catfish ( Silure, Som, Waller or Welse ) thrives in the tree-lined Ebro near Tortosa, growing to over 200lb and two meters in length, and our 2km of private swims are the perfect place to have a holiday of a lifetime fishing for these huge creatures. 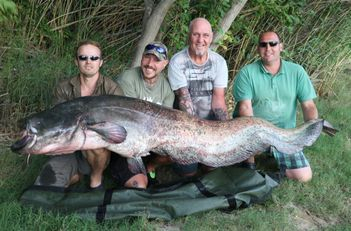 We have years of experience of fishing for big wels catfish and our accommodation is located right beside the river, just 50m from the banks. All of our equipment is top-of-the-range and our boats are well equipped and fully registered. Typically, a day’s catfishing will involve targeting them from the bank with large pellets, or meat baits. Additional boat fishing trips for Wels catfish are also popular and productive for triple-figure specimens (please inquire for prices and availability). The anglers will benefit from the experienced Ebro Sporting Adventure guide during their stay and this includes professional-standard photography of you and your catch too. Our aim is to give you an amazing week-long catfishing experience on the Lower Ebro with lots of arm-aching battles and PBs on the bank, all in beautiful Catalonia countryside. If you want to fish until your arms can’t take any more, on your own or with your fishing mates, you can! Or, if you’d like a more relaxing holiday with a partner or the family. This could be the one for you. Tackle hire. We supply top quality Shimano reels and rods loaded with quality braid.Chairs, pods, mats, gloves, scales, slings and everything else you need. We also supply rigs, end tackle, bait (pellets, etc. 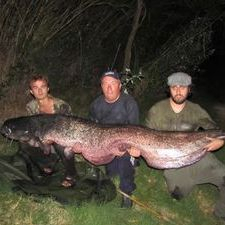 ), Also our experienced guide to help you target and land those triple figure Wels catfish successfully. We offer week-long stays or shorter, three-day or long weekend breaks to suit your timing. You can also target river carp and other species of fish during your stay. The local area has plenty to offer the non-fishing partners or family too, including the historic town center, beaches and wildlife. Pellets: The halibut pellet is the newest way of catching an Ebro Catfish, and they are very affective. It’s a lot like using a boillie for carp, in that you hair-rig the bait or series of baits on a ledger rig over a bed of loose-feed, but seriously stepped up; bigger rod, bigger reel, bigger bait, bigger fish! Methods: There are various methods to tempt the catfish, one is to ledger or free-line baits like, boilies or meats. Look for any likely feature that the catfish would patrol in - like marginal shelves, snaggy areas, deep holes and cover - and place your bait there and wait. Lures: Lure fishing is the most exciting way to catch a big catfish, for the best results cast your lures in to fast flowing water and use something with lots of vibration and noise. 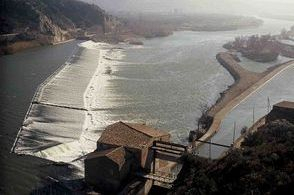 This is the L'assut de Xerta, (Xerta Weir) which is home to Black Bass, Sea Bass, American Large-mouth Bass, Zander and Wels Catfish.